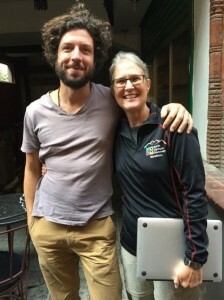 After nine weeks in Nepal, Colorado Nepal Alliance Director Anne Hines is back home in Denver, but our organization’s work in Nepal continues to gain momentum. While Anne is focused on fundraising during the holiday season, the day to day details of our newly-announced Kuri School Rebuilding Project are in the able hands of CNA volunteer Jeremi Poulin. Among other things, Jeremi has experience with construction projects in India, and has traveled extensively in Nepal both independently and as the leader of trekking tours. We are so grateful to have Jeremi as a member of our team! Comparing architectural designs and building techniques. Jeremi accompanied Anne and Gopal Tamang to Darkha VDC in October during the second of three trips Anne made to this remote group of villages. He attended all but the very initial meetings with Landmark ADS, the architectural firm designing the replacement buildings at the Kuri school. Jeremi is extremely well informed about the project and has cultivated strong relationships with everyone involved. 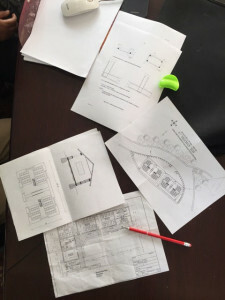 In addition to project logistics, one of Jeremi’s main goals is to help our Nepal Project Coordinator Gopal Tamang develop and refine his skills for leading construction projects, so that Gopal can manage the project by himself in the future. Jeremi meeting with Ajay Magar of Landmark ADS, and another Nepali architect using a similar building technique as that being proposed by Ajay. Recently Jeremi has been interviewing other architects to better understand how they produce their cost estimates and surveying different architects’ preferences and choices and their impact on the bottom line. At CNA we are committed to safe, locally appropriate, and cost-effective construction techniques. In support of those goals, Jeremi has been working hard with our architect to lower construction costs as much as possible. Estimating costs has been particularly challenging since the Nepal–India border has been mostly closed due to protests following Nepal’s passage of its first constitution on September 20th. The border closure has made importation of construction supplies nearly impossible, leading to large price hikes. Fuel has been severely limited, making transportation costs skyrocket. They are also very hard to predict as they change whenever tankers are able to bring some fuel from India (and more recently, from China) to Nepal. As you can see, Jeremi and Gopal have lots to do, but we’re confidant that they’re more than up to the challenge!